It is no secret that Canada owns one of the world’s largest oil reserves. There it is logical to assume that USD/CAD would be correlated to oil prices. We have shown the results of this study often and even showed a recent chart illustrating the correlation no FX30.com (Oil and USD/CAD chart). However, here is another correlation that you may find interesting. 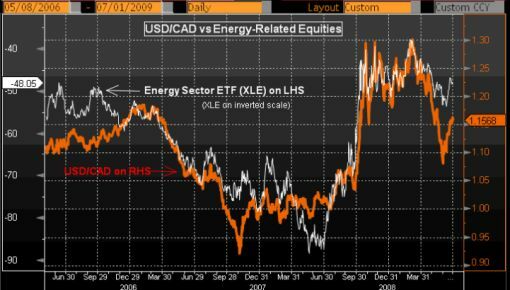 USD/CAD has a nice positive relationship with the energy sector ETF which makes logical sense. So if you are trading USD/CAD, make sure you keep an eye on the ETF for any anomalies.